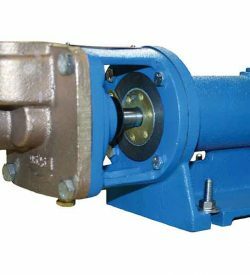 BURKS Series ET turbine pumps are available for capacities up to 8 GPM (0.50 lps) – pressures up to 150 PSI (1034 kPa) and temperatures up to 225 °F. (107 °C), with standard mechanical shaft seal. Special shaft seals are available for higher temperatures and fluids other than water. Coupling guard furnished on all complete Base-Mounted units manufactured by Burks Pumps. Not furnished with purchase of pump only, but required. BURKS is the only turbine pump with Life-Lok® external Impeller adjustment feature that allows readjustment of impeller without disturbing piping, disassembling pump or replacing parts. Gives up to 40% longer service life than turbine pumps of other designs. 4ET – 1725 RPM – 60Hz. ET – 3450 RPM – 60Hz. ET – 2900 RPM – 50Hz. Series ET Pumps are available in a Jacketed Seal Cavity design for pumping hot oil, hot water and also heat transfer fluids in common use in high temperature heating or cooling applications. This feature greatly extends seal life in high temperature applications. To order, add suffix “J” to pump catalog number for temperatures below 400°F (204°C) and add suffix “JK” to pump catalog number for temperatures over 400°F (204 °C). Example: ET6MJ. See Section on High Temperature Pumps for more information. NOTE: When pumping hot water over 180ºF (82.2 ºC), check the NPSH available in the pumping system against the required pump NPSH shown on pump performance curves. Available NPSH must be greater than required NPSH. Individual performance curves in conclusion should be checked for final selection.